What have learned from mature markets? In recent months, we’ve been hearing a lot about technology companies launching mobile payments on smartphones in the US. In October 2014 we saw the launch ofApple Pay. In February 2015, Google announced its acquisition of Softcard—a joint-venture between US mobile operators formerly known as ISIS, who had laid off 60 staff in January 2015—a move many commentators believe is in response to Apple Pay. In addition to gaining Softcard’s back-end technology and intellectual property, Google Wallet / Android Pay will soon be preloaded on all phones sold by AT&T, T-Mobile, and Verizon in the United States. Softcard isn’t the only mobile operator joint venture offering payments that has seen a change. For example, both WEVE (a joint-venture between UK mobile operators) and Buyster (its French equivalent) have abandoned their plans to launch mobile payments in 2014. Over the last four years, the battle for how mobile payments integrated into existing payment networks has been brewing. With Apple using their own secured element, and HCE (Host Card Emulation) now a feature on Android, NFC phones can be securely authenticated without using the SIM card. Based on recent developments, it is clear that device manufactures (Apple and Samsung) or operating system players (Google) are in an advantageous position in developed markets. Whilst this battle has had no impact on mobile money it should be seen as a warning by mobile operators in emerging markets. 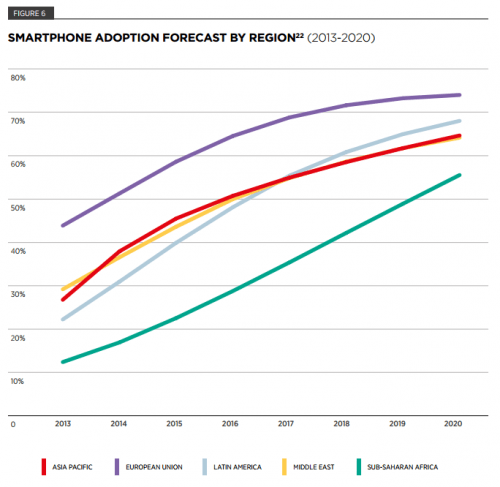 Whilst smartphone adoption in Sub-Saharan Africa is 12.5% , a lot of early adopters and influencers already have smartphones. The subsequent battle is for the next generation digital payment networks. Increasing levels of smartphone adoption are beginning to pave the way for non-MNOs (internet giants or start-ups) to offer mobile payments using apps (see figure above). For instance, 62% of mobile money providers already offer a smartphone application as a channel to access their platform . Social media apps (SnapChat, Line, WeChat, Twitter, Facebook/WhatsApp and Square) have started to dabble in mobile payments. Expect to see many more announcements this year. So far five messaging services have gone beyond chat and introduced payment services. These are KakaoTalk, Line, WeChat, SnapChat and Facebook messenger. Without a doubt, mobile operators have made a fast start. In December 2014, there were 299 million registered and 103 million active mobile money accounts . However, given mobile money is primarily a distribution business, agent networks remain a key asset for mobile operators, and it remains to be seen how long it will be before that is disrupted. In many markets, regulators are removing exclusivity clauses from agent contracts allowing new entrants to piggy back on existing agent networks. Most mobile money services operate as independent schemes with little or no ability to transact with other mobile money services. As a result, the value they provide is severely limited compared to other services than operate without geographical constraints. Imagine if voice calls didn’t interoperate? How useful would it be if you could only make calls to people on your own network? By interoperating their mobile money services, operators can maintain their mobile money leadership position by building out by far the largest cross-platform global digital payment network, and in doing so combat the threat posed by internet players, who already have large global networks and their sights set on taking over mobile payments. Both banks and internet players use asymmetric business models. Banks in general do not charge for deposits or withdrawals and generate revenue by intermediating funds (lending, etc.). Similarly, internet players generate their revenue by selling software or advertising. However, mobile operators also enjoy indirect benefits, such as customer retention, increase spend on their mobile network and savings in airtime distribution costs, which will allow them to compete on price. That said, interoperability is likely to gain faster take-up from customers if operators price cross-network transfers at the same price as within their network, helping to create the network effect they need.